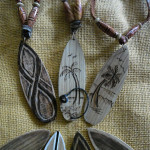 Our newest stock line for craft markets are wooden surfboard necklaces. 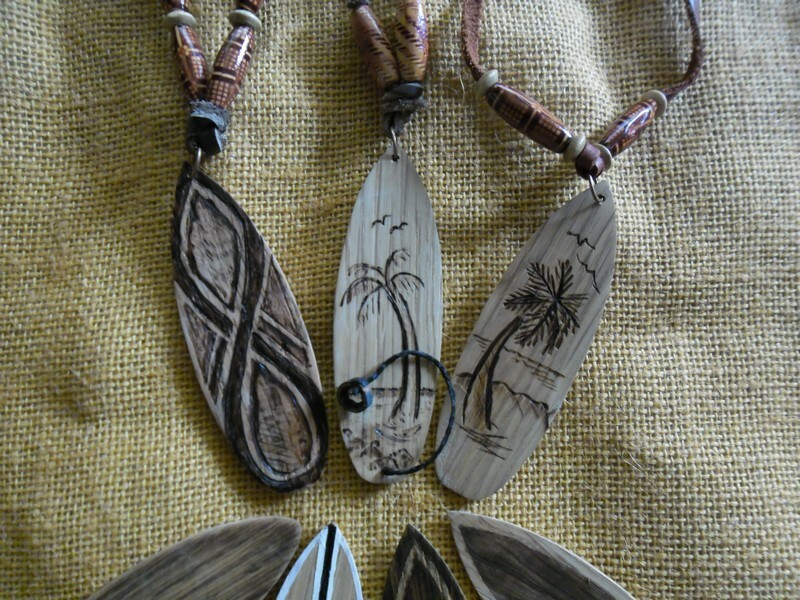 Each surfboard necklace has its own unique design, and each surfboard necklace is individually sanded to shape, adding to its own individuality and uniqueness. 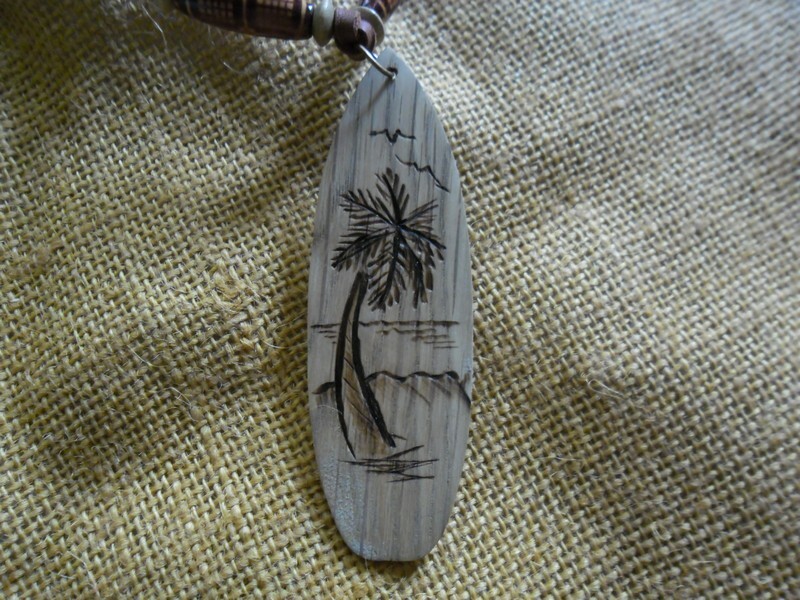 The wooden surfboard necklaces made so far are all made from Oak. We have a small supply of oak strips, between 30 and 40mm wide, and 3mm thick, which is what we use to make the surfboard necklaces from. As is usual for most crafters who sell at craft markets the product line is constantly evolving. 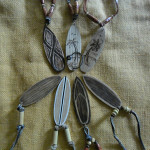 A few weeks ago I started planning the surfboard necklace range. Terry and I spent considerable time on the surfboard design, to get it as accurate as possible. Once the board design was finalized I had to introduce a moderate to mild rocker in the profile, as the wood was too thin to allow much profile shaping. I made a simple jig which would allow me to bend the oak strips along the length. The manufacture process involves marking out, cutting the wood stock to length, and at this point I soak the strips in boiling water for 30 minutes. After the soak the strips of wood are put into the jig, and clamped in place. They will spend at least 6 hours in the jig. After removal from the jig each surfboard is sanded and shaped, before they are sanded to a smooth finish. Once the sanding is done we decide on the final design for each surfboard necklace. The final design could be a simple stain or a beach scene, or an intricate celtic knot design. The design is added to the board in any of a number of ways, from masking and staining or painting, to burning the design into the wood. After the design has been completed the surfboard has a hole drilled into the end, and is given a light finishing sand. The final sanding will scuff the design, which is what we want, and will also remove any wood fibres that may have lifted during the design process. To address any concerns surfing purists may have regarding the skeg – or not adding a skeg – we decided not to add a skeg as a skeg on a surfboard this size will be (a) structurally weak, and (b) very possibly hurt the wearer. On this specific surfboard range we refuse to add a skeg that is not as close to scale as possible. 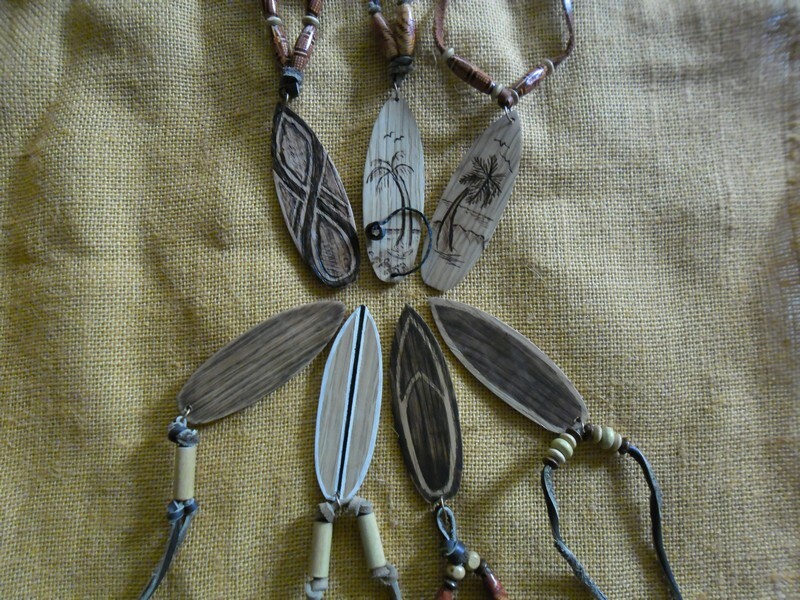 To finish the surfboard necklace we add a jump ring, a leather cord, and a few beads. To allow the surfboard to fit most anyone a leather slider is added. 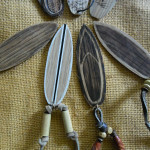 Encouragingly, we sold several of these wooden surfboard necklaces at the first craft market we took them to. 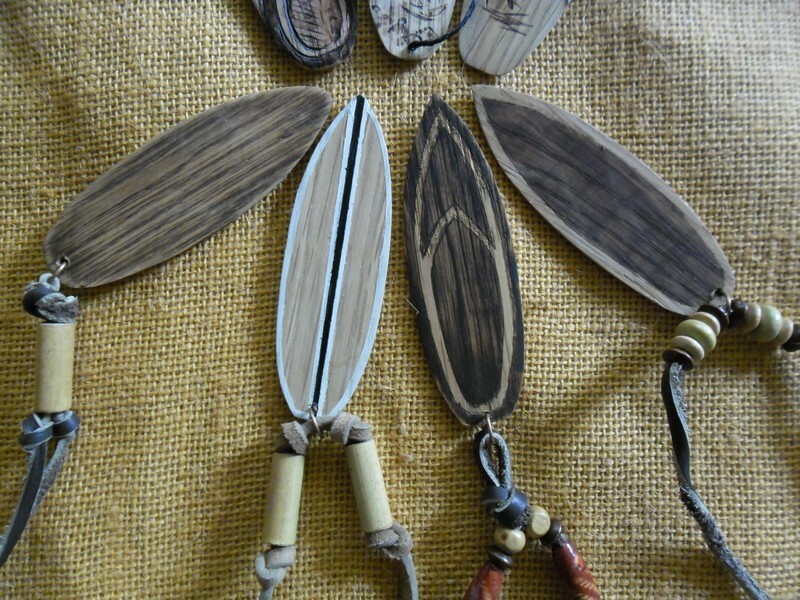 I’m looking forward to making – and selling – lots of these little surfboard necklaces. They are attractive, individually challenging, and a pleasure to make! and to contact us from there.